We found a shortcut to the McDonalds at the train station for breakfast and met my good friend Tom Lathrop back at the Hilton to say goodbye. He had arrived on Friday and felt he had covered the show to his satisfaction. There were a number of larger manufacturers who chose to rely on their local dealers and spend the big bucks at the New York show, three weeks away. For me it relieved some of the pressure and allowed me time to listen to more rigs with my own music. I also had the opportunity to meet and talk with more personalities in this diverse industry � from well-known names to niche players. Perhaps it was this lack of pressure that caused me to overlook one of the most important rooms at the show. 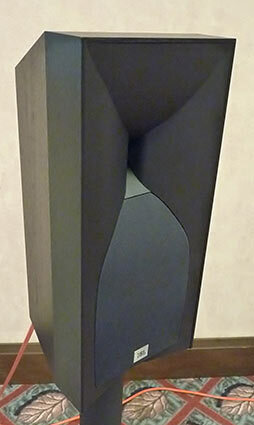 Bryston was featuring their new Model T Signature floor-standing speaker, part of a new line of Model T speakers. The standard Model T and the stand-mount Mini T were on silent display. The Model T Signature differs from the standard model by having the crossovers external to the speaker cabinet. The crossovers were in small boxes on the floor behind the speakers, and contain upgraded parts. The Model T Signatures cost $7500 with a vinyl wrapped finish, with wood veneer available for an extra $1000. 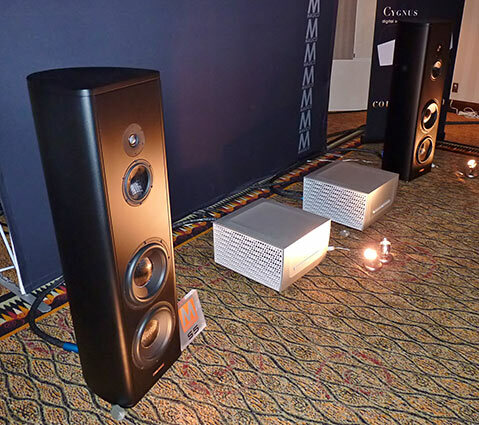 The speakers were driven by a pair of Bryston 28B SST2 monoblocks, which are rated at 1000W per channel. This system sounded exceptionally transparent and uncolored. The speakers seem to provide high value for the price. 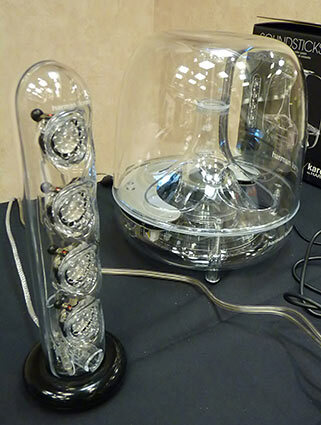 Bryston was also demonstrating their BHA-1 headphone amplifier, which can drive balanced or unbalanced headphones. I tried this amp with my Denon AH-D5000 headphones, and it seemed to provide exceptionally deep and well-controlled bass. I hope Tom has bailed me out this time. Around the corner and down the hall I ran into Steven Huang of Audio Sensibility at his table full of audio cables, connectors and a couple of large boxes of LPs that his wife, Jean, was overseeing while Steven talked with customers one on one. You seldom have that opportunity with the big name wire companies, but since Audio Sensibility sells factory direct, shows are the life blood of his advertising. Several cables and cords are in my various rigs and I can attest to their excellent value. 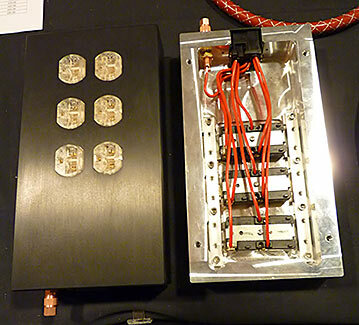 On display here was an open and shut case of his Statement Power Distribution box that is nearing finalization. Milled from a billet of aluminum it features cryogenically treated Japanese Phosphor Bronze receptacles at the starting price of $600, but Furutech FPX audio grade or GTX state of the art will be available at extra cost. The clean lines seen on the black anodized one on the left were achieved using bars and screws to hold down the receptacles from within. Thus tightened, they are said to be free of vibrations. I noted the star grounding and the Cardas pure copper binding post on the rear to run a separate ground to earth if you wish. Missing from the photo were the EMI/RFI absorbing materials that come standard. A blog of the manufacturing process is accessible through his website. Think "built like a tank." I had seen this dude in many of the rooms I visited yesterday and took the opportunity to say hello when we met in the hall. 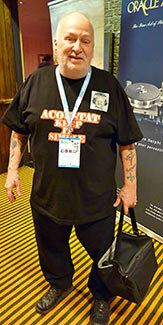 He is "Mr. Acoustat" as his shirt proclaims on the back. Google his name and you will learn he has been an audiophile for forty years and worked with Acoustat electrostatic speakers since 1984, as well as being a frequent contributor to many forums. The photo on his shirt is used as his ID on his postings. It was a pleasure to chat with him, brief though it may have been. Think "dyed in the wool." Plurison had a high end lifestyle rig in the St. Leonard room comprised of the ultra-sleek and very high-tech Devialet all-in-one component. It was displayed freestanding on a plastic stand, though it is more typically hung on a wall. I'm delighted and surprised to see the staying power this ground-breaking component has because it brings people to this level of music that would never put up with the multi-box conglomeration most audiophiles configure. "One and done," as the saying goes. Just add speakers to suit your artistic persuasion and enjoy the music. In this case it was a tall floorstander from Focal. Music for this presentation was sourced from a laptop, but the presentation was elegantly minimal. And as Tom suggested to me at dinner last night, you really can't go wrong with Focal. They may not be the absolute best in any category, but as a company, they are really good from top to bottom of the line. In an open area outside the Plurison room they had one of the very few home theater setups I saw at the show. 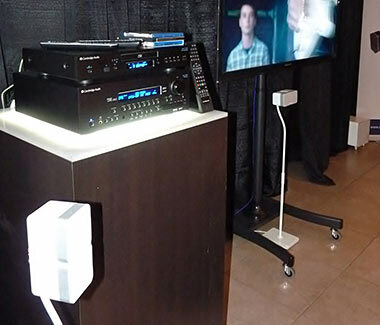 A Cambridge Audio Blu-ray player combined with a $2000 Cambridge receiver to nicely fill the space with the small cubic Cambridge Minx speakers. They did the job. On silent display nearby was an opaque stand mounted monitor that was a miniature rendition of the tall glass enclosed Arabesque speaker from Crystal Cable I've heard in years gone by. I'm much more comfortable with the wood enclosure. 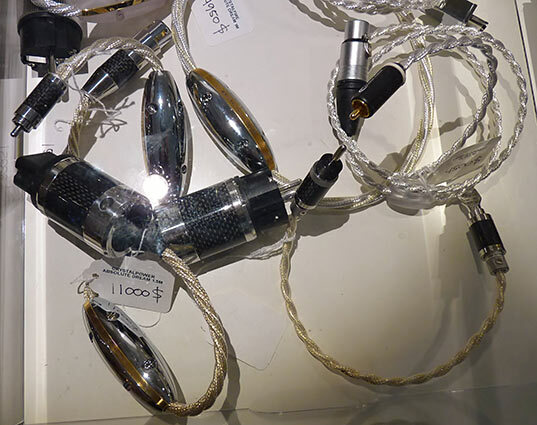 And in a glass display cabinet, looking like a "girl's best friend" was a sample of Crystal Cables' Crystal Power Absolute Dream 1.5m power cord for $11,000. Some of their interconnects approached a more affordable price range. 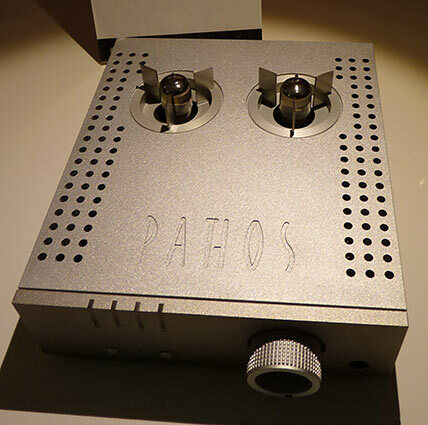 Taking on an unfamiliar aesthetic approach (I'm more accustomed to their metal, wood and paint styling), was this Pathos Aurium headphone amplifier for $1495. Running in pure Class A with a tube input stage and MOS-FET power stage, this 3.6 w @ 32 Ohm amplifier with zero feedback offers both single ended and balanced inputs. With variable output impedance from 10 to 1000 Ohms, it should drive most any headphone. While I'm not into headphones, I experienced some serious lust for this little amp that has a lot more features than I've mentioned here. Check it out if this is your game. Sliding over into the Fontaine H room, aka Geek Place I encountered some familiar names from my early days in mid-fi audio. Gone are the glory days of JBL's 4300 Series of the 1970's, but looking at the form factor of their little stand mounted monitor I couldn't help imagining what Altec Voice of the Theater might be like if it morphed into a contemporary version of this JBL on a larger scale. 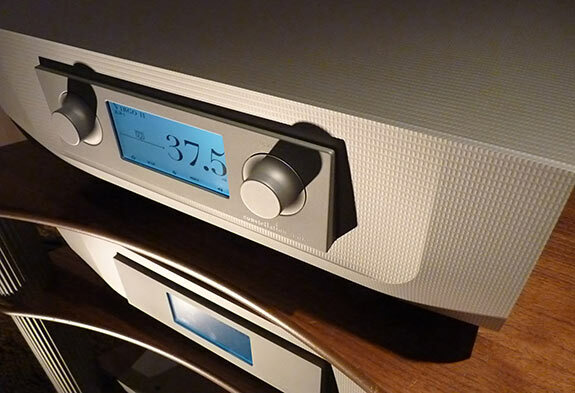 The grill below the horn on the Studio 530 ($700) conceals a small conventional driver and a floorstanding version is available for around $2000. They are rear ported and bi-wireable. Unfortunately, the people here spoke much better French than English, and I could not listen to them. The clear plastic desktop speakers by Harman Kardon, another of my mid-fi favorites, made me feel like I had stepped out of the Hilton and into a Radio Shack. My host quickly diverted my attention to the small BC Acoustique piano black monitors Act A 1.1($700), along with BC Acoustique EX302 integrated amplifier (40 wpc, $299) and EX602 CD player, same price, all coming from France at what seemed like very reasonable prices. These were the entry level units with larger amps, CD player and speakers above them. 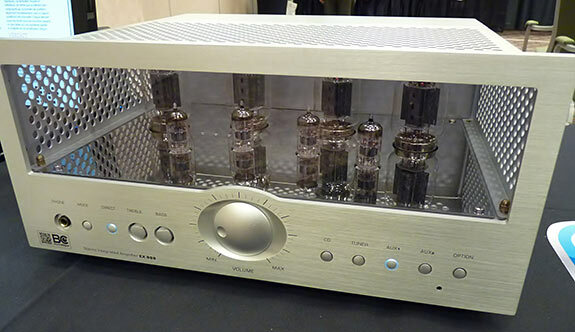 The EX888 amp, weighing 23.4 kg and putting out only 40 wpc ($1999) was their only tube product and it looks like it deserves some serious attention. Rare at any price, this handsome unit featured tone controls as well as headphone amplification. Pole vaulting from the Fontaine H to the Point aux Trembles I went from entry level to the very upper echelon of High End audio. 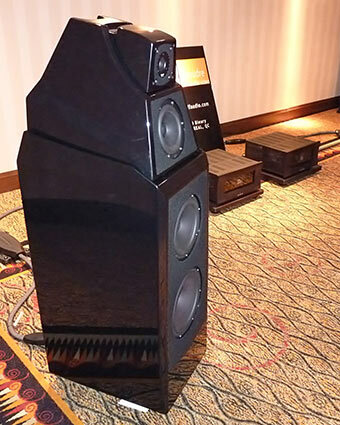 Magico S5 ($28,700) floorstanding speakers were driven by Constellation Audio electronics in the Performance Series, connected with JPS Labs Aluminata series, their top line of cables. The Virgo II preamp ($29,000) took music from the Cygnus II media player ($29,000) and fed it to the Centaur monoblocks (500 watts, $27,000 each). The two slim boxes beneath the preamp and media server were their separate power supplies. The Cygnus is also available as a DAC only. 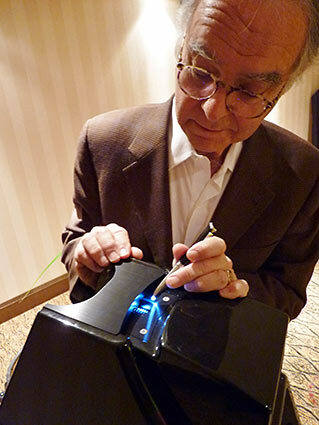 Peter Madnick, the man behind Constellation, graciously walked me through the system and was delighted that I marveled at the finely machined grid on the faceplates and the unusual ventilation side panels of the power amps. 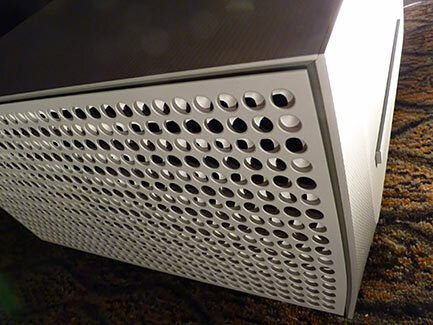 These panels, which were actually machined from both sides and created a moir� pattern of holes, were designed to meet European safety standards to keep the fingers of small children away from the hot heat sinks that cover each side of the amplifier. As much a tube lover as I am, there was no denying the extraordinary quality of music in this room. 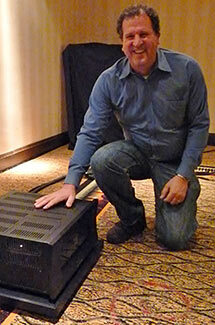 It was not only among the Very Best Rooms at the show, but one of the very best solid state systems I've ever heard. I'm not pretending to tell you anything new here, just lining up with the legions of others who have already praised their virtues. Right next door in the Longueuil Room equipped by Coup de Foudre I ran into Peter McGrath again this year with the new Wilson Alexia loudspeaker ($48,500?) which was designed to bring the adjustability of the Maxx III and its resultant sound quality down close to the size of the Sasha for people with more modest size listening room. In addition to treating me to some of his excellent recorded music, Peter demonstrated the importance of exact positioning of the drivers. After playing a short piece, he went to the speaker and adjusted the tweeter unit about 0.25" further away from the listening position and re-played the same piece of music. The soundstage and dynamics greatly diminished, although the focus didn't suffer nearly as much. He re-set the tweeter and heavenly music reappeared. In the awe of the moment my critical faculties were disabled, but in retrospect this was still an important demonstration. 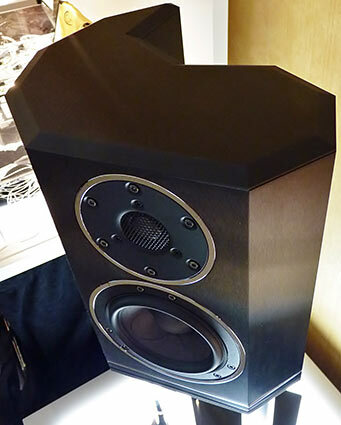 Most speakers do not have such adjustability, yet a lot of other speakers sound great, nonetheless. The designer must certainly get the physical positioning of the drivers correct either through physical alignment or crossover design. And the listener must certainly get the positioning of the speaker in the listening room correct to achieve maximum greatness. But as I have seen on some speakers and can certainly be done with many, the tilt back is also adjustable, though this also changes the direction all the drivers aim toward. With the Alexia, only the distance is changed, not the aim of the drivers. I wish there was a way I could share the profound experience this demonstration was for me. Certainly, I will henceforth give a lot more attention to speaker set-up, good as I thought I might be. Luke Manley walked me through the rig here which was fronted with a MacBook Pro running bit perfect with a Sound Devices hard drive feeding into a DaVinci Light Harmonic DAC ($25,000) that goes up to 384 kHz. Analog was handled by a Clearaudio Innovations Compact turntable ($11,000 with arm) with a Y-shape plinth using a Brinkman Pi cartridge ($4000). The phono stage was the new VTL TP 6.5 Signature that is about as flexible as they come with many features including power, input select, mute, phase reverse, rumble cut, mono, gain and cartridge loading all adjustable from the remote control. If you've got $8500 for a phono stage, plus another $2000 for the input transformer they were using, you are excused now to jump over to their website to read all about it. It matches the TL 6.5 line stage and the TL 7.5 line stage ($20,000) that was used in this system. Functionally, it looks like king of the hill. Also available was the Audio Aero LaFontaine CD player. The power amps were VTL MB450 monoblocks. Transparent cabling was used throughout, including the Reference MM2 speaker cables. The cables alone totaled $58,500 for the system. The music here was a little more effortless than last year with the Sashas as the Alexia seemed better suited to the large room. As in past years this room was among the Very Best Rooms at the show due in no small measure to the expert set-up offered by Peter McGrath and company. And being right next door to the Magico/Constellation room you might ask, "Well, which was better?" If I were to answer that, I would also have to tell you that I am a tube guy at heart. More importantly, with side-by-side rooms of extraordinary excellence, the show offered visitors the opportunity to answer the question "Am in a tube guy or am I a solid state guy? Or babe?" If you swapped just the speakers in these rooms, I expect you would still be able to answer that question. Of course, if you have a latent fear of screwing in light bulbs or unresolved childhood trauma involving breaking glass, your fate is sealed, but at least the opportunity for immediate comparison was available. In the photos above, that's Peter McGrath adjusting the Wilson Alexia and Luke Manley showing how cool his VTL's run by holding his hand on the amp for a hundred count. I had a great chat with Luke in the hall about his late father who founded the company and the history of VTL, including how they have advanced to the leading edge of tube gear design.